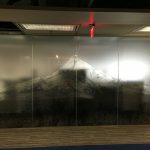 Here are some cool custom window film and graphic projects we’ve been working on lately that might inspire you! 1. This is the Standard Insurance Building in Bellevue, WA. 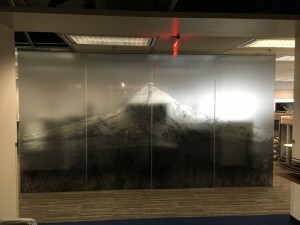 We added a frosted Seattle Skyline to their conference room windows. 3. This is the Standard Insurance Building in Downtown Portland. We added a 3D graphic to the conference room glass. 4. This is the main hallway that runs through the Genentech building in Hillsboro. They wanted something other than solid frost, so we added a helix to break it up. 5. This is the executive boardroom at the Daimler Trucks North America Corporate office in Portland, Oregon.They wanted privacy and interest, so we created a custom print. 6. At the Standard Plaza downtown Portland, they wanted semi-privacy. So, we created a custom fade film that starts opaque at the bottom and gradually becomes clear at the top. 7. For Grassa in downtown Portland we applied a custom print that incorporated their name and logo on the entry doors. They wanted it to be seen – did we succeed? If you would like to add some interest to your workspace, call Pacific Window Tinting, Inc. today at 503-736-9000! We’d be delighted to discuss your ideas.